Need more gain for your scope? 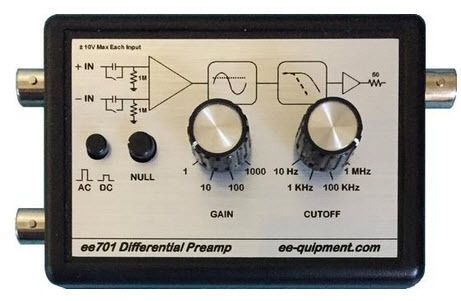 The ee701 differential preamp from ee-quipment might be just the ticket. 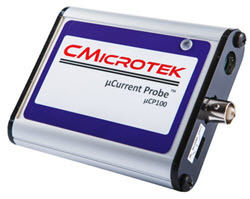 As the name suggests, it's a two-input differencing amplifier that lets you probe signals from microvolts to volts. The ee701 differential preamp. Picture swiped from vendor's web site. 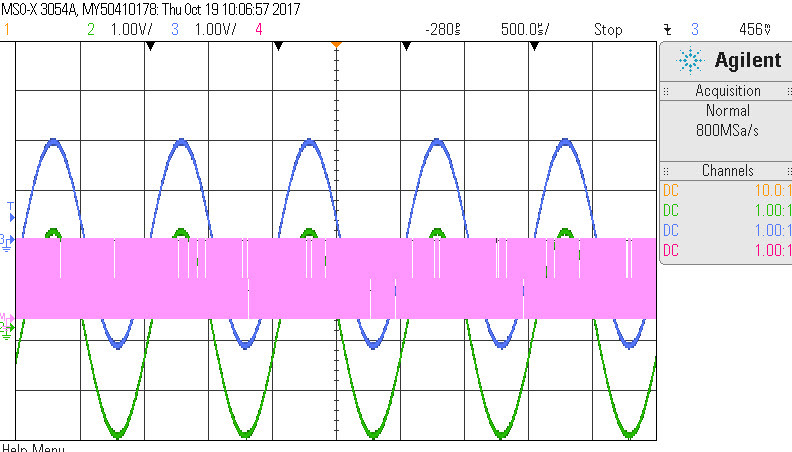 The picture speaks for itself - you can see the input can be DC or AC coupled, and the gain and cutoff frequency are easily selectable. The two BNCs to the left are the signal inputs and the one on the right goes to the scope. What's not shown is the wall-wart which plugs in on the right side. I ran one through its paces and it behaves just as advertised. In the photo below you can see it connected to my Siglent SDG 2042X dual-channel arbitrary waveform generator. In this case the two channels drive the ee701's inputs. I've set the ARB to generate two synchronized sine waves of the same frequency. One channel is putting out 4V peak-to-peak; the other 4.010 volts. With a gain on the preamp of 1000 that 10 mV difference is huge on the scope. I can think of two uses for this unit. The first is to amplify very low-voltage signals. My Agilent scope's most sensitive scale is 1 mV/division, which isn't adequate for microvolt levels. Further experimentation showed that cranking up the scope gain on the two input chanels reduced the size of the "noise," though at no gain could I make out the 10 mV difference. 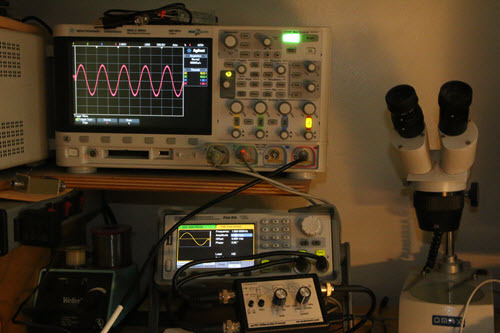 The signal's frequency matches the scope's 4 GS/s sampling rate. This correlates with quantitazation error of the scope's 8 bit A/Ds. As a sanity test I set one of the ARB's channels to 4 V and the other to 5V, and the subtraction worked as expected. I found the same effect on an another scope from a different vendor. It's a nice unit, and recommended if you need to handle small signals, or signals with a large common-mode component. The only thing I didn't like about it is that there is no LED indicating that it's powered on, which is a pretty minor quibble. This preamp is pretty similar to Tektronix's ADA400A, though at $395 sure beats Tek's $2000 price.